As the international debate over religious intolerance rages, comments shared by Atascadero Mayor Tom O’Malley on Facebook have led to criticism and outrage from supporters and opponents. On Sept. 24, O’Malley posted a link to a conspiracy blog that claims that Muslims are overtaking the White House. The poster goes on to erroneously report that President Barack Obama ordered five nuclear carriers from the Middle East in early 2014, endangering the lives of U.S. service men serving overseas. 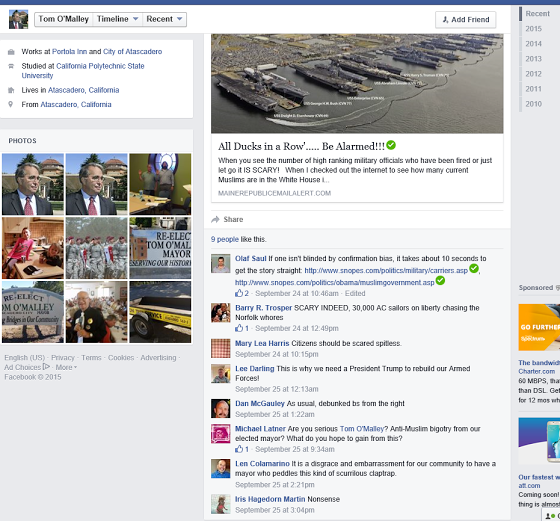 Shortly after O’Malley shared the post on his personal Facebook page, several readers voiced their concerns. “Citizens should be scared spitless,” wrote Mary Lee Harris. Lee Darling utilized the comment as a reason to vote for Donald Trump for president. “That is why we need President Trump to rebuild our armed forces,” Darling wrote. Nevertheless, most of the commentators, including former Atascadero City Council candidate Len Colamarino, chastised the mayor for promoting a conspiracy blog. “It is a disgrace and embarrassment for our community to have a mayor who peddles this kind of scurrilous claptrap,” Colamarino wrote. Others questioned the mayor’s perceived support of religious prejudice. O’Malley’s decision to share the controversial post has also raised concerns about the freedom of speech rights of elected officials. On one side, proponents contend O’Malley has the right to share posts and his opinions on social media without facing scrutiny. Others, such as former Atascadero mayor Mike Brennler said the public has a right to discuss the views public officials promote on social media. I would think most CCN readers would agree with Tom 100%. IDEA………Let’s all show up at the next Council meeting and wait for open discussion and then bring up this subject. Who’s In? Last fiscal year, Wal-Mart opened 354 U.S. stores, including Supercenters and its smaller Neighborhood Markets. Next fiscal year, the company estimates it will add between 135 and 155 stores. O’Malley is apparently gullible about the prospects for the Atascadero supercenter as he is about false conspiracy blogs. What does the Atascadero “Staff” think about their O’Malley promised rewards stemming from the Wal-Mart jackpot? That’s NINE off-ramps, thank you very much! The elderly Fox News watchers in Atascadero elect guys like this to the city council, then wonder why their town in such a beautiful location never became anything but an off-ramp. At least someone in government recognizes our enemy when he sees them.